Educators and Parents are Faced With More Social Media Based Issues With Their Young Students Every Year. A Proactive Stance can Help. Recently I attended an orientation session for my daughter, in preparation for her entering 6th grade next year. During the session, the teachers did a great job of raising awareness of the growing frequency of problems they are dealing with arising from how these young students are using social media. I did not realize how much of an issue this has become for teachers and for administration. They explained how they are often learning of conflicts or concerns among the students. They are put in the difficult position of being forced to play detective to try and determine how much of an issue it is, what took place, and what, if anything, to do about it. There is a well-founded concern among parents and in our schools about social media based cyberbullying leading to suicides among our preteen and teen children. Who hasn't come across one of these terribly sad stories? Maybe you even know of such a story from your local area? This is surely a case where an ounce of prevention is worth a pound of cure. I spent a few hours this weekend searching for tips and techniques to help educators reduce the likelihood of social media driven issues with their students. Combining what I learned with suggestions from the great staff at Kinry Road Elementary School, and my own personal perspective as a parent, I developed this list of approaches to help parents and educators limit incidents and issues by tackling the problem head on. Develop a culture of awareness and support: First and foremost, it is vital that schools discuss these challenges openly. Dialogues about proper use, cyberbullying, sexting, and the many other realities of social media use are vital. Encourage students to talk about their concerns, as well as the fun uses of these technology tools. Make sure to include social media in your Code of Conduct Policy: This is pretty straightforward. Don’t leave social media out of your Code of Conduct Policy. Here’s an example: http://www.gahannaschools.org/District/SocialMediaPolicies.aspx. Remember – Instagram and many other social media apps require users to be 13 or older! While this can certainly be a bit challenging to adhere to in reality, at the very least it is a powerful lever in managing your children’s access. I am sorry to admit that I did not realize that Instagram had this age limit (I was aware of it for Facebook, but a lot good that does, since most kids this young don’t like Facebook anyway – it’s what their parents use and to them it isn’t cool). Now that my daughter is immersed in Instagram use and we think it’s not entirely fair to disallow it at this stage, it is vital that we take certain measures (more on those below), and the age limit makes the discussion, and the enforcement of rules, easier. Parental education: Educating parents is a key component of a proactive effort to control social media driven problems with preteens and young adolescents. Educators need to make a point of getting parents involved in the conversation, and the sooner the better. And don’t just do this once a school year and consider it done, look for other opportunities to bring it up and raise awareness (just don’t go overboard). Parents should know their kids’ user names and passwords (and monitor accounts): This is pretty straightforward. It needs to be a condition of use. “If you want access, we need to know your user name and password”. Then we need to be sure to check their accounts. Do it with your kids or without them, that is your decision, but just make sure to do it from time to time (it’s a good idea to set a schedule). When they complain about an invasion of their privacy, remind them that they will have a right to a higher degree privacy when they are adults, but in the meanwhile, it’s your responsibility as a parent to be involved in their lives in this way (and help protect them whether they like it or not). Provide a way for students to report issues: Students need to know who they can turn to when they become aware of, or are victims of, an issue that arises for them on social media. There should be a clear direct way for them to do this (“inform your teacher, and they will inform the Principal”). It may also be worth considering an anonymous route, for those who may be scared to share their concern or problem (of course, this can bring its own problems since trouble makers can report false issues). How do you approach this at your school? Develop a peer mediation program: My daughter’s school has a Peer Mediation program. These are increasingly common. This can be a great way for students to help each other work through issues, including social media based challenges. Here's a complete curriculum from PeerMediators.org. Encourage parents to talk about social media use with their kids: Part of each school’s approach should be reminding parents about the importance of talking with their children about how they use social media. This doesn’t have to be a purely ‘negative’ conversation – it is an opportunity to discuss the fun and creative ways that students use these tools, learn more about their friends, and learn about these technology tools (many kids are a lot more up on social media than parents – I learn stuff from my kids all the time!). 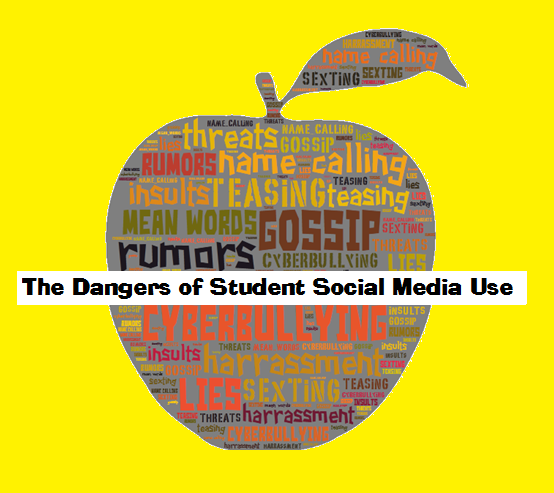 Define consequences: Students need to know that if they violate the social media code of conduct, they are subject to defined remedial actions and loss of privileges. Hopefully these ideas will help to protect students while allowing them to enjoy the fun side of social media use. This is really a growing problem and it is likely to continue to get worse as social media continue to weave their way into our lives, and technology devices continue to proliferate. It is up to all of us as educators and parents to tackle these issues head on and take proactive measures. What are YOU doing to help ensure that social media remains fun and allows for constructive and creative collaboration and learning? Do you have other approaches to share that have worked well at your school? It’s 2014 – Can You (Systematically) Text Your Students? Do Social Media Benefit College Students by Engaging Them in the Course Material? Can You (Systematically) Text Your Students? Excellent point Sara – thanks. I agree – Teachers should be educated on how these tools work and encouraged to spend time with them themselves, if they aren’t already. How many schools let kids play on a playground completely unsupervised? How many teachers have never played on that playground and therefore don’t truly understand the concept of the playground?How do kids learn playground rules? While I agree with all 10 of your steps, those steps could be applied to any character-education situation. Bullying, dress code, drugs…all would apply. Social media is neither against the law or a necessarily bad activity. When used appropriately, it can be the most helpful and educational tool there is. What we need to do is not only teach appropriate use, but model appropriate use as well. Parents and teachers who are not participating WITH their kids are missing on great learning themselves. In addition, they are missing many chances to connect and learn from others.